After being sold out within three weeks of its debut, the Eric Clapton inspired myTouch 3G Fender Edition is ready to make a comeback. 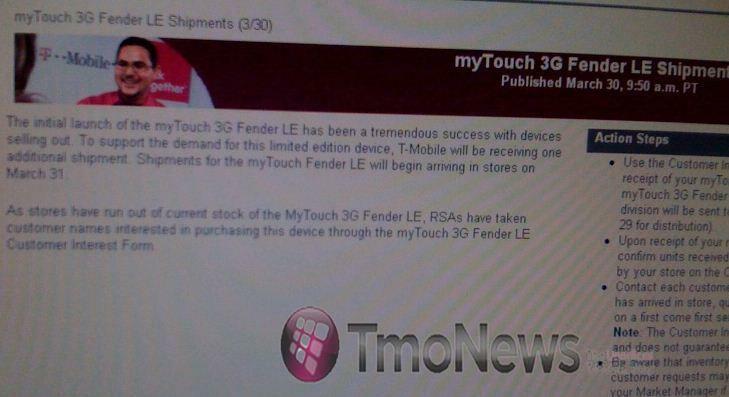 Deemed a tremendous success, T-Mobile stores will be receiving one additional shipment on March 31st. But act quickly, because our sources tell us that this this will be the last shipment T-Mobile will receive. Remember, you can always get one free! Why are they re-releasing a low end platform device. The Mytouch lags on android 1.6 donut, and has a horrible camera, and very poor battery life. The only thing it has that is good is its size, not too large nor too small. If they really want to compete, they need to import the Nexus’s into their stores. While I’m ranting, T-mobile and Samsung totally blew it with the Behold II . Its was/is a good device but that darn touch wiz . I currenly own one but installed Pandahome from Market and it makes the phone run 3x as fast atleast without any need to root the rom or flash anything. While I have a original Fender MT3G from the first batch (stashed away) since I knew it was going to be limited and a special phone for it’s time. Perhaps it’s time to look up eBay if a second batch is coming. I too had a Behold II and sold it due to the frustrations with that “phone”. It’s almost an Android version of a WinMo phone overloaded with bloat in a nice coat of polish. So far, the best mid range phone (the MT3G is not a low end device), is the Motorola Cliq. It’s got a bit of everything from the range of Android phones out there. Sure I love my Fender MyTouch (but wish for a Gibson tie-in someday to match my bass), but wish the limited edition stayed a limited edition. If it prints money, I guess the second batch will do well for Tmo.